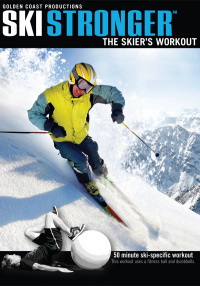 Ski Stronger - The Skier's Workout, a comprehensive, and easy-to-follow, ski-training program that you can do anywhere. From the makers of Surf Stronger comes Ski Stronger - The Skier's Workout, a 50-minute, comprehensive, and easy-to-follow, ski-training program that you can do anywhere. Certified trainer, Scott Adams takes you step-by-step through a ski specific training program to help develop the leg strength, core stability, and total body conditioning to make you a better athlete and a better skier. Exercise index with detailed instruction for key exercise progression and modifications. Get in shape to ski at your best.